​Disney’s Contemporary Resort has the distinction of being the first resort to open at Walt Disney World in 1971. In addition to being on the Monorail line, this resort is also the only one in walking distance to the Magic Kingdom. The Contemporary Resort is also home to Bay Lake Tower, which is part of the Disney Vacation Club. In total, the resort has 1083 (655 hotel rooms and 428 villas). If you find the idea of staying in a resort that is within walking distance of the Magic Kingdom appealing, then Disney’s Contemporary Resort is the one to choose. This massive A-frame tower with two Garden wings was one of the two original Walt Disney World resorts. The futuristic atmosphere of the Contemporary Resort is obvious when you see the Monorail glide through the main building. In addition to monorail transportation to the Magic Kingdom and from the main monorail hub into Epcot, buses are available to get you to Downtown Disney, the Animal Kingdom, and the Disney Waterparks. There’s also a water ferry that transports guests to the neighboring Wilderness Lodge. The 14 story Grand Canyon Concourse is where you will find the monorail station, shops, restaurants and a 90 foot high Mary Blair mural with a Southwestern theme. Published room rates at the Contemporary for 2013 range from $330 a night for a Garden Wing standard view room in value season, to $551 for the same room during the holidays. Room types available here are Garden Wing standard view, Garden Wing garden view, Garden Wing king or deluxe room, Tower room with Bay Lake view or Tower room with a Magic Kingdom view. The Magic Kingdom view rooms range in price from $507 per night in value season to $715 per night during the peak holiday season. The spectacular views are yet another advantage of staying at Disney’s Contemporary Resort. Most guest rooms enjoy beautiful views of the Seven Seas Lagoon, Bay Lake or the Magic Kingdom. The Electrical Water Pageant that glides across Bay Lake nightly can be viewed from the beach area of this resort. In 1991, a meeting and convention center was added to the Contemporary Resort. It features 90,000 square feet of meeting space, including a 42,300 square foot ballroom. An interesting fact about the Contemporary is that the rooms were prefabricated. They were built off-site and hoisted into place once the hotel was built. Here’s another bit of trivia: the original name of the Comtemporary was the Tempo Bay Resort Hotel. There are currently 27 reviews for Contemporary Resort. Read Full Contemporary Resort Reviews! You can also search for Disney’s Contemporary Resort specific threads! 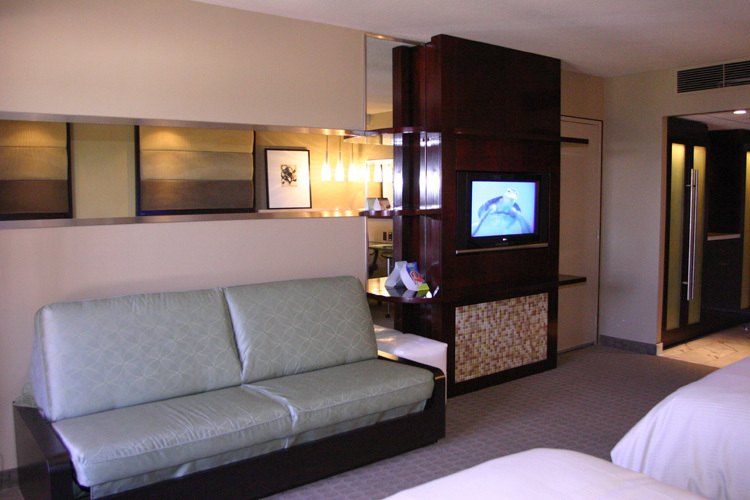 Both standard rooms and suites are offered at Disney’s Contemporary Resort. At 422 square feet, the guest rooms here are amongst the largest on Disney property. Guest rooms feature 2 queen size beds (or one king size bed) and a daybed, table with 2 chairs, armoire, television, nightstand, refrigerator, telephone, key-operated in-room safe, wall mirror, ceiling fan, large bathroom with hair dryer, luggage rack, iron and ironing board and a balcony/patio. The patios on the first floor rooms in the Garden wings are not private, they are shared with your neighbors. Guests who need to connect to home or work via the Internet while vacationing, will have high speed service. Roll-away beds may be requested for siblings who do not wish to share a bed, (there is a $15 per night charge for this).Also available are bed boards, bed rails and cribs (the pak-n-play variety) call Housekeeping to request.If there are more than 2 adults in the same room, there is an additional charge of$25 per person, per night. The following are available by calling Housekeeping:coffee makers (supplies may be limited), extra pillows, blankets and towels, and International Electrical Adapters. There are 25 suites with either Park or lake views. 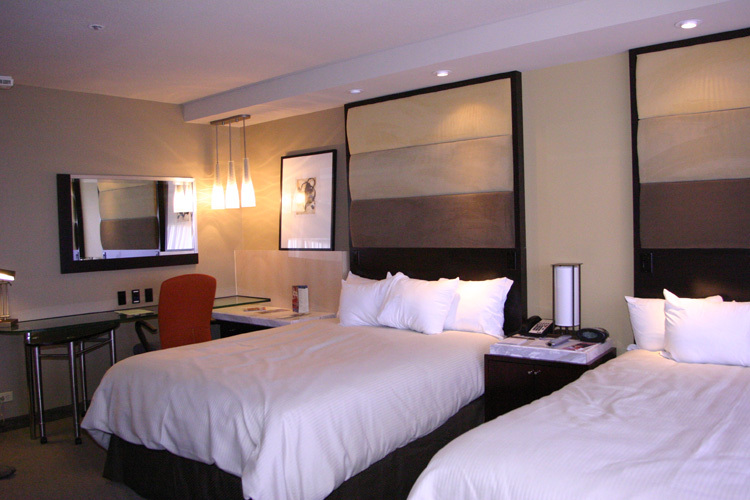 One and two bedroom suites with two queen size beds and sleeper sofas are available. 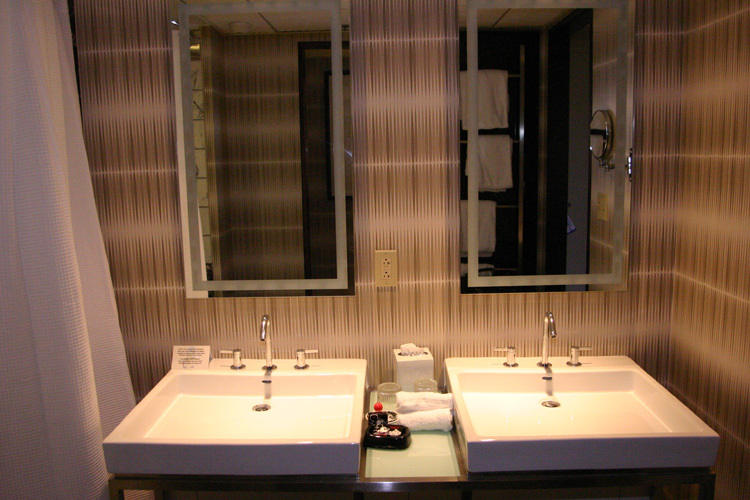 Suites include two-line speakerphones, an additional phone in the bath area, hair dryer, bathrobe and turndown service. The eleven Concierge suites are found on the 12th and 14th floors. Concierge services include: making dinner or recreation reservations for you, answering questions, planning outings, a lounge that offers a continental breakfast, daily appetizers, an evening cheese bar, desserts, cordials, free beer, wine, soft drinks and bottled water, and turndown service (that includes a Mickey chocolate on your pillow). TIP: The South wing rooms are closer to the pool, and convention center. The Tower rooms offer incredible views of Bay Lake, the Seven Seas Lagoon or the Magic KingdomPark. They are also closer to the monorail station, restaurants and shops. Garden wing rooms can be quite a distance from the monorail. However because of the proximity to the Grand Canyon Concourse, some Tower rooms may be noisy. Check-in is at 3 p.m. and check-out is 11 a.m.Guests may check in as early as 7 a.m. and if the room is not ready, store your bags with Bell Services and head for the theme parks.